I recently re-watched the movie “World War Z” while on vacation last week. I’m a big Walking Dead fan, but this movie took zombies to a whole new, freaky level. At one point in the movie, Brad Pitt (looking as handsome as ever) quickly severed the hand of a soldier who was helping him. He did this just seconds after she had been bit on the finger by a zombie. See, the zombie virus was so powerful it could turn you into a zombie in a matter of seconds. By acting quickly and removing the threat, Brad Pitt was able to save the soldier’s life. As gruesome as it may sound, what are ways that you can chop off your own hand in the studio? Are there bad habits you are hanging on to that do nothing but poison your music? Do you work on songs much longer than you need to? So much that you end up ruining the songs with your endless tweaking and changes? If so, I challenge you to do something drastic. Force yourself to mix an entire song in one hour. I’ve done that many times, and it is always a learning experience. Force yourself to record an entire song using only an SM57. I’ve done that as well, and it too was a learning experience. Identify the big time-wasters and music-killers in your studio. Then come up with creative ways to lop ‘em off. You may be surprised how much better your music gets because of it. 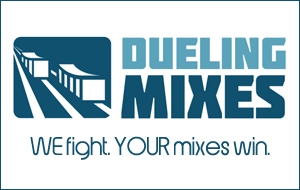 If mixing is your main focus, then you should become a Dueling Mixes member TODAY. We just posted new tracks for a RIDICULOUSLY fun song.